Camping is a family value. Well, for our family at least ;) Teaching our kiddos to appreciate nature and a simple lifestyle is not easy. 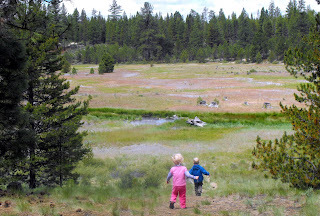 Frankly, camping is not exactly the relaxing vacation that I would always pick out..but our kids have such a splendid time getting dirty, riding bikes and learning about nature that I would feel like a heel to suggest anything else. 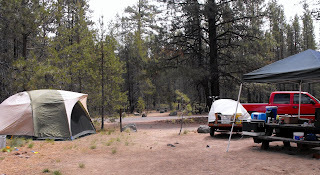 I wouldn't mind an upgrade to a tent trailer...that would still be considered simple..frugal no? Our adventures took us to Newberry National Volcanic Monument. I delighted in the purchase of a National Parks Passport book for each kiddo and placing their first stamp inside. I look forward to filling up their books with many more adventures. What a great vacation spot. So beautiful and serene. I love that first picture of your little ones. Oh the adventures they are having. What a great vacation site and so much room for the kids and big kids to roam LOL! They will always remember these days. I remember fishing at the lake with my grand parents and cousins with such fondness. Great days. Seeing pictures of camping makes me really want to hurry and get something planned. We haven't gone for years, but we did buy a new tent (the old one was a 2 man) so we can all fit. Camping is one of my favorite memories from growing up. Your camping trip, although a lot of work, just looks gorgeous. I am not a big camping fan, but I do enjoy it now and then. That would be a fantastic vacation. Hi Jenni~~ When my kids were little we went camping a lot. Now that they're older I look back and think I must have been nuts with all the work and dirt which explains, at least to some extent why I was always tired. And, admittedly how happy my kids were! Priceless memories. You're a good mom!